End users expect to be able to work anywhere, at any time, and from any device. Additionally, they expect a similar experience for accessing work apps and data across all their devices—desktop, laptop, tablet, and smartphone. Meeting these expectations is becoming more and more complex for IT teams that continue to use multiple disconnected tools to manage mobile and desktop devices. A unified endpoint management (UEM) solution provides a holistic and user-centric approach to managing all endpoints. VMware AirWatch® Unified Endpoint Management™ provides IT with a comprehensive view of asset inventory and full lifecycle management of endpoints across the organization. 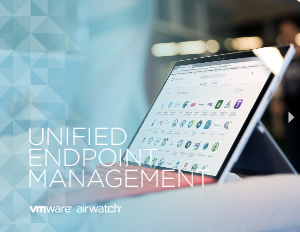 Read more to learn why leading organizations around the world rely on VMware AirWatch unified endpoint management for their enterprise mobility solution.